It's that time of year again! Let's face it do we need more stuff? What if gifting could be practical and thoughtful at the same time? 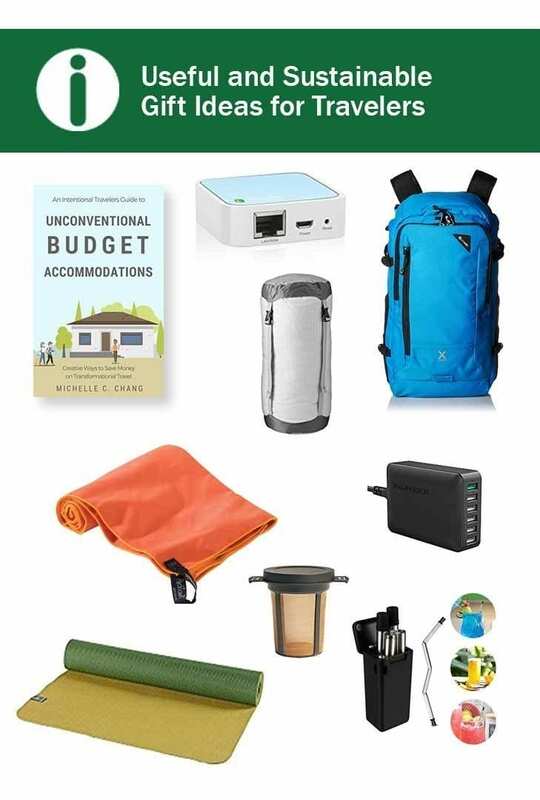 What if you could find items great for travel that are of good quality, that can be used for multi and regular use, reduce waste and stand the test of travel? It's possible! 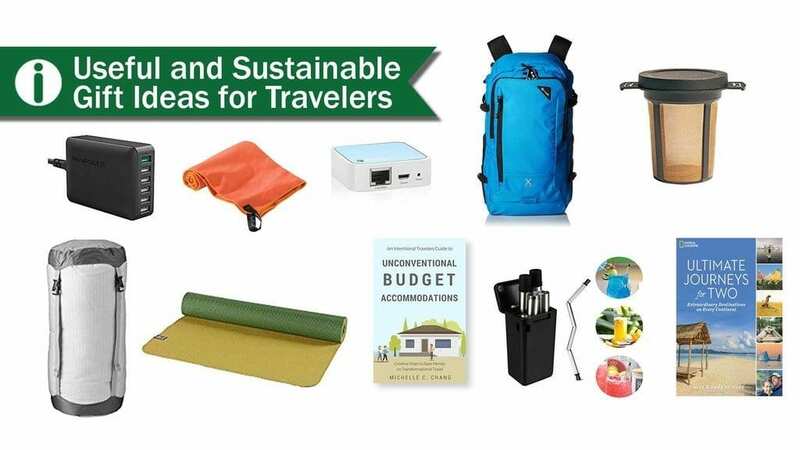 We've put together this better-solution-consumer- products list of sustainable gift ideas for travelers that we use and love. These products last, will give you peace of mind, and they aren't going to land in a landfill anytime soon. We've divided these items into categories to help you decide on gifts for someone going traveling or frequent travelers categorized by: where to spend your time, effort and money. Why not value experiences over things? and you can do it as a couple. 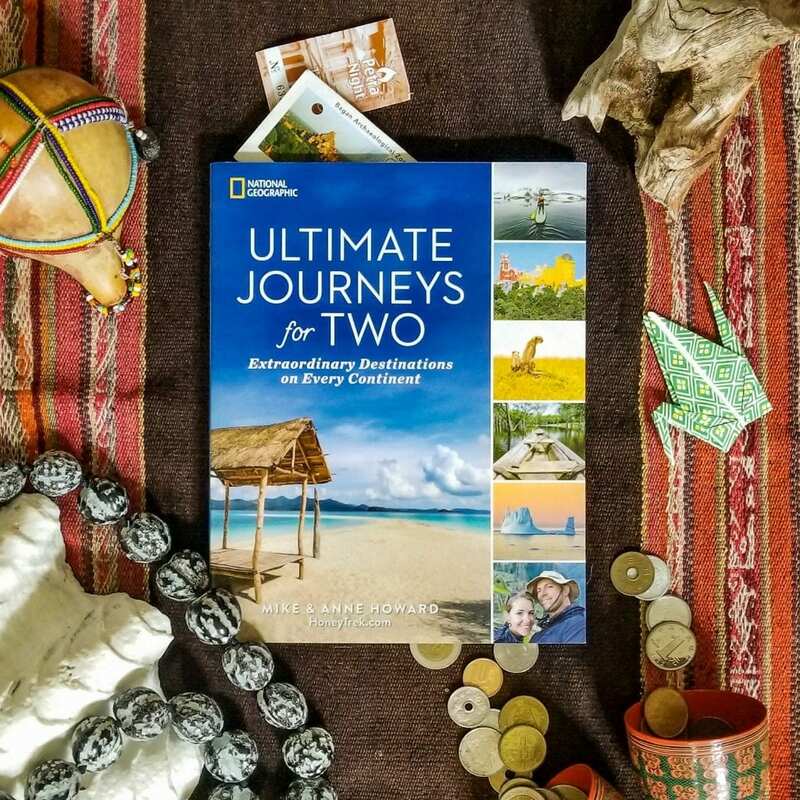 Check out the book- Ultimate Journeys for Two -- This is a National Geographic guide written by the World’s Longest Honeymooners (aka our friends Mike & Anne of HoneyTrek), It's a book of 75 favorite destinations and savviest tips for couples adventure travel. You can find it on Amazon Check latest prices and order details or you can buy a special limited edition signed copy and this travel couple happen to be super nice people too. Use it over and over again, or reshare it with travelers - let this thing become a useful coffee table book. Instead of giving things, give experience gifts! We recommend a gift voucher from Intrepid Travel - Small, local group adventures to virtually anywhere in the world. We've been booking these tours for years and now taking our 10th trip with them, why not treat someone to a giftcard for a big adventure and local experience? Special offer! From now until November 28, 2018, enjoy 20% OFF all trips departing in 2019. Click here to check prices and details for Intrepid Travel. Do you want to travel longer and more meaningfully? The cost of accommodation is your biggest expense, but what if you could reduce that AND take in some enjoyable local experiences? 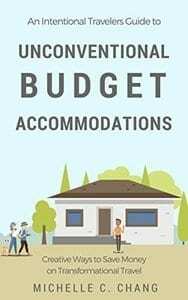 Our friends at Intentional travelers wrote an awesome book: Unconventional Budget Accommodations and discovered so many ways to cut costs and benefit with local exchanges. Definitely one of the best useful travel gifts. It's available for kindle or in paperback. Find latest pricing and availability here. We have been using the same travel bags for YEARS because they give us peace of mind from getting our things stolen. Our bags are slashproof, super functional and durable. Pacsafe bags fit the bill as eco friendly travel bags - Every zipper is puncture proof, the entire bag is slashproof, and every section can be carefully locked so you don't have to worry about your stuff,even in busy train stations. This 30L bag goes everywhere with us, first it is slash proof, with puncture proof zippers that connect so no one can get into your bag unless you want them to. It’s also comfortable to wear and fits us perfectly with comfortable, adjustable straps. It's perfect for even your weekend packing list. Check latest pricing and details here. Does the traveler in your life carry a computer and cameras when traveling? The Pacsafe Travel safe inserts into any bag (or into the backpack above) and you can lock it to anything to protect your gear. Attach it to furniture in your hotel, use the cable to lock while you are waiting at a busy bus station so you won’t lose anything even if you are distracted. This video explains the features from Pacsafe and why its a useful gift for travelers. Check latest pricing and details here. This is our carry all Backpack - Front opening bag, slashproof, and it converts from a backpack to an attractive travel bag. Loads of room for any kind of travel. Check latest pricing and details here. For more packing tips and great camera bags from full-time travelers, you can find them here. This is one of the newer eco friendly travel products available. Save on the waste of straws and set a great example for others to say no to plastic. This handy stainless steel straw includes a collapsible straw, cleaning brush and carry case perfect for carrying in your purse. Check prices and availability here. Life is too short to drink a bad cup of coffee. That is why we like to be prepared wherever we are in the world. Make the perfect cup from anywhere, this also works for tea! We recommend this often as one of the best eco friendly gifts for coffee lovers. Check here for prices and availability. The comforts of home - traveling with your own towel, plus quick dry functionality with microfiber, and you have the perfect travel companion. A super practical gift for campers, hikers, runners even to use at an Airbnb when you just prefer your own towel. Check here for prices and availability. Giving the gift of movement and exercise is one of the most useful gifts for travelers and people who stay active. This mat is durable, slip-free AND you can fold it flat or rolled so it can easily pack in a bag multiple ways. This Prana Nomad mat is awesome for exercise and yoga virtually anywhere such as hotel rooms, guesthouses, patios and backyards. (PS please read the care instructions to maintain its quality) Check prices and availability here. Strength workouts have been the gamechanger for our overall health. Expensive set of weights or a massive home gym to get a good quality exercise are not required a system can be completely portable. We recommend the TRX system, functional and travel friendly and one of the best purpose gifts. We've used this portable gym on hotel room doors, attached to trees in a park or in a playground. Check prices and availability here. Have you ever stayed in a hotel room and the WIFI signal is too weak? This probably happens all the time! It’s usually because the WIFI modem is too far from your room. This Wifi Range Extender allows you to get a boost of WIFI to improve your signal. A useful gift for travelers as well as a stress reducing tool. Easy to set up and very portable. Check here for pricing and details. We have traveled with many different charging devices in the past, and this is by far our favorite device. It is a 6 USB portal charging station so we can charge our camera batteries, phones, watches for both of us, all at the same time. You can never really have enough USB ports, and this one does it all for us. Check here for prices and availability. Do you have any favorite travel gifts to add to this list? Let us know we want to expand our list with great products recommended by you. We hope these useful and sustainable travel ideas were helpful for you to plan your shopping list whether you need a gift for someone going abroad or heck, just keep it for yourself. For more useful travel tips you can find them all here.